Cult film know-it-all, author, festival programmer and publisher Kier-La Janisse has a lovely gift for all of her fans and lovers of big and small screen horror entertainment. 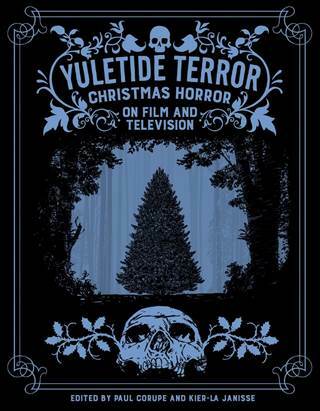 Released via Janisse’s micro-publishing imprint Spectacular Optical, Yuletide Terror: Christmas Horror on Film and Television is a comprehensive new collection of essays charting some of television’s spookiest holiday horror shows. From the BBC’s A Ghost Story for Christmas series to Silent Night, Deadly Night (and the ensuing controversy), from Eastern European folk-horrors all the way up to the seasonal succubi of the “New French Extremity”—followed by a compendium of nearly 200 Christmas horror film reviews. Yuletide Terror follows on the success of Spectacular Optical’s previous books Kid Power! and Satanic Panic—the latter of which promptly sold out and was reprinted in a second edition by the UK’s FAB Press. It is the third book in Spectacular Optical’s ongoing series of limited run film and pop culture books. Contributors to Yuletide Terror include Stephen Thrower (Nightmare USA), Kim Newman (Nightmare Movies), Maitland McDonagh (Broken Mirrors/ Broken Minds), Caelum Vatnsdal (They Came From Within), longtime FANGORIA editor Michael Gingold and many, many more. The cover, which we reveal here for the first time, is designed and illustrated by UK artist Alisdair Wood, who will be creating chapter headings throughout the book. The launch of Yuletide Terror will be accompanied by screenings and events in multiple cities. More details, including a full table of contents, will be announced in spring 2017. For more information go here.